Before the industrial revolution, all trim was made and applied by hand, thus making heavily trimmed furnishings and garments expensive and high-status. Machine-woven trims and sewing machines put these dense trimmings within the reach of even modest dressmakers and home sewers, and an abundance of trimming is a characteristic of mid-Victorian fashion. As a predictable reaction, high fashion came to emphasize exquisiteness of cut and construction over denseness of trimming, and applied trim became a signifier of mass-produced clothing by the 1930s. The iconic braid and gold button trim of the Chanel suit are a notable survival of trim in high fashion. Passementerie or passementarie is the art of making elaborate trimmings or edgings (in French, passements) of applied braid, gold or silver cord, embroidery, colored silk, or beads for clothing or furnishings. 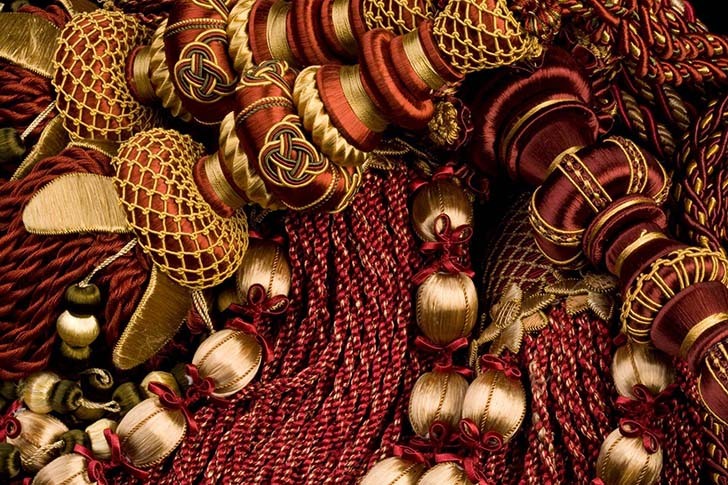 Styles of passementerie include the tassel, fringes (applied, as opposed to integral), ornamental cords, galloons, pompons, rosettes, and gimps as other forms. Tassels, pompons, and rosettes are point ornaments, and the others are linear ornaments. Colefax and Fowler - since 1933. Colefax design library. Designers Guild - "Discover our collection of Trimmings & Tiebacks." Duralee - "Luxury Tassels, Tapes & Trimmings." Franklin Mill Store - "Ribbons and Trimmings for Home Decorating." Gerster - "High end trimming collections." Graf Paris - soft furnishings. Harlequin - specially designed and coloured to complement the extensive range of Harlequin fabrics, Arabella Trimmings will give added glamour and luxury to curtains, blinds, upholstery, cushions and accessories. Joel & Son Fabrics - "Specialists in Haute Couture Fabrics." Buy fabric trimmings online. Nada Designs - "Handmade Egyptian Cotton & Trimmings." NINA CAMPBELL - since 1974. 8 Designs available. Osborne & Little - since 1968. "Exquisite designer trimmings and accessories." Sanderson - "The Sanderson Trimmings collection comprises seven versatile trimming styles including Picot Braids, Wide Braids, Bobble Fringes, Drop Bead Fringes, Pleated Ruffles, Flanged Cords and Beaded Braids. Almost one hundred trimmings are presented in 17 colour sets ranging from linen, and duck egg,to charcoal and plum." Style Library - braids, button tufts, cords, fringings & tie backs. The Lining Company - since 1953. "The Lining Company, take pride in being one of the leading suppliers of top quality Linings and Trimmings." V V Rouleaux - since 1990. "V V Rouleaux quickly became the destination for designers and decorators, lovers of colour, and texture and anyone looking for inspiration! We now supply over 5000 luxury ribbons, tassels, braids, flowers, feathers, cords, and other trimmings in 100 colours." Watts of Westminster - "Gimps, Galloons, Satinings, Spangles, Soutaches and limace de spirals, might sound like the names of fairy-tale hobgoblins and wood sprites but are actually part of the evocative etymology of Passementerie. Watts beautiful tassels and trims continue to be handmade using the same ancient traditions."